Deluxe Silicone Rubber Strap with 16 MM Stainless Steel Safety Lock Clasp. High Quality Silicone Rubber Strap with 20 MM Stainless Steel Safety Lock Clasp. High Quality Silicone Rubber Strap with 22 MM Stainless Steel Safety Lock Clasp. High Quality Silicone Rubber Strap with 22 MM Stainless Steel Safety Lock Clasp. Strap has wavy design. High Quality Silicone Rubber Strap with 24 MM Stainless Steel Safety Lock Clasp. Strap has wavy design. 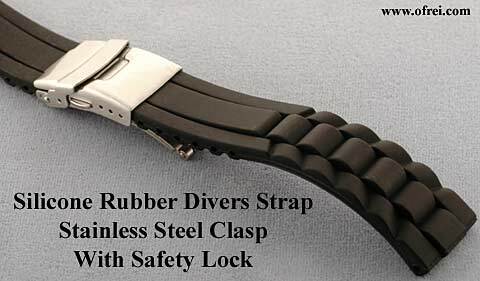 Deluxe Silicone Rubber Strap with 18 MM Stainless Steel Safety Lock Clasp. Silicone Rubber Strap with Stainless Steel Buckle. 20 mm lug size by 18 mm buckle size. Total length of strap is 7 5/8 inches. Silicone Rubber Strap with Stainless Steel Buckle. 22 mm lug size by 20 mm buckle size. Total length of strap is 7 5/8 inches. Silicone Rubber Strap with Stainless Steel Buckle. 24 mm lug size by 22 mm buckle size. Total length of strap is 7 5/8 inches. While on your wrist the strap looks like a leather strap, however since it is Silicone Rubber you will never have to worry about getting the strap wet. Black Silicone Rubber and White Stitch Strap with Stainless Steel Buckle. 20 mm lug size by 20 mm buckle size. Total length of strap is 7 3/4 inches. While on your wrist the strap looks like a leather strap, however since it is Silicone Rubber you will never have to worry about getting the strap wet. Black Silicone Rubber and White Stitch Strap with Stainless Steel Buckle. 22 mm lug size by 22 mm buckle size. Total length of strap is 7 3/4 inches. Black Silicone Rubber with White Stitch and Stainless Steel Buckle. 20 mm lug size by 18 mm buckle size. Buckle end measures 3 1/8"; hole end at 4 5/8". End to first hole at 1 7/8"; end to last hole at 3 3/4". Total length of strap measures 7 3/4 inches. Center Semi Padded with Rectangular Holes. Black Silicone Rubber with White Stitch and Stainless Steel Buckle. 22 mm lug size by 20 mm buckle size. Buckle end measures 3 1/8"; hole end at 4 3/4". End to first hole at 1 15/16"; end to last hole at 3 13/16". Total length of strap measures 7 15/16 inches. Center Semi Padded with Rectangular Holes. Black Silicone Rubber with White Stitch and Stainless Steel Buckle. 24 mm lug size by 22 mm buckle size. Buckle end measures 3 1/8"; hole end at 4 3/4". End to first hole at 1 15/16"; end to last hole at 3 14/16". Total length of strap measures 7 15/16 inches. Center Semi Padded with Rectangular Holes. Black Silicone Rubber with Red Stitch and Stainless Steel Buckle. 18 mm lug size by 16 mm buckle size. Buckle end measures 3 1/8"; hole end at 4 5/8". End to first hole at 1 7/8"; end to last hole at 3 3/4". Total length of strap measures 7 3/4 inches. Center Semi Padded with Rectangular Holes. Black Silicone Rubber with Red Stitch and Stainless Steel Buckle. 20 mm lug size by 18 mm buckle size. Buckle end measures 3 1/8"; hole end at 4 5/8". End to first hole at 1 7/8"; end to last hole at 3 3/4". Total length of strap measures 7 3/4 inches. Center Semi Padded with Rectangular Holes. Black Silicone Rubber with Red Stitch and Stainless Steel Buckle. 22 mm lug size by 20 mm buckle size. Buckle end measures 3 1/8"; hole end at 4 3/4". End to first hole at 1 15/16"; end to last hole at 3 13/16". Total length of strap measures 7 15/16 inches. Center Semi Padded with Rectangular Holes. Black Silicone Rubber with Red Stitch and Stainless Steel Buckle. 24 mm lug size by 22 mm buckle size. Buckle end measures 3 1/8"; hole end at 4 3/4". End to first hole at 1 15/16"; end to last hole at 3 14/16". Total length of strap measures 7 15/16 inches. Center Semi Padded with Rectangular Holes. 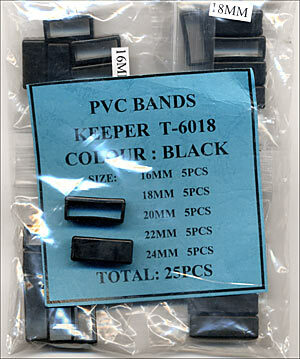 Black Silicone Rubber with Blue Stitch and Stainless Steel Buckle. 18 mm lug size by 16 mm buckle size. Buckle end measures 3 1/8"; hole end at 4 5/8". End to first hole at 1 7/8"; end to last hole at 3 3/4". Total length of strap measures 7 3/4 inches. Center Semi Padded with Rectangular Holes. Black Silicone Rubber with Blue Stitch and Stainless Steel Buckle. 20 mm lug size by 18 mm buckle size. Buckle end measures 3 1/8"; hole end at 4 5/8". End to first hole at 1 7/8"; end to last hole at 3 3/4". Total length of strap measures 7 3/4 inches. Center Semi Padded with Rectangular Holes. Black Silicone Rubber with Black Stitch and Stainless Steel Buckle. 18 mm lug size by 16 mm buckle size. Buckle end measures 3 1/8"; hole end at 4 5/8". End to first hole at 1 7/8"; end to last hole at 3 3/4". Total length of strap measures 7 3/4 inches. Center Semi Padded with Rectangular Holes. Black Silicone Rubber with Black Stitch and Stainless Steel Buckle. 20 mm lug size by 18 mm buckle size. Buckle end measures 3 1/8"; hole end at 4 5/8". End to first hole at 1 7/8"; end to last hole at 3 3/4". Total length of strap measures 7 3/4 inches. Center Semi Padded with Rectangular Holes. Dark Blue Silicone Rubber with Blue Stitch and Stainless Steel Buckle. 20 mm lug size by 18 mm buckle size. Buckle end measures 3 1/8"; hole end at 4 5/8". End to first hole at 1 7/8"; end to last hole at 3 3/4". Total length of strap measures 7 3/4 inches. Center Semi Padded with Rectangular Holes. Dark Blue Silicone Rubber with Blue Stitch and Stainless Steel Buckle. 22 mm lug size by 20 mm buckle size. Buckle end measures 3 1/8"; hole end at 4 3/4". End to first hole at 1 15/16"; end to last hole at 3 13/16". Total length of strap measures 7 15/16 inches. Center Semi Padded with Rectangular Holes. High Quality Brown 21 MM Alligator Grain Style Rubber Strap with White Stitching and Stainless Steel Buckle. Strap is reportedly made from the same factory in Switzerland as many Omega rubber straps. 21 mm lug size by 19 mm buckle size. The reinforced ends has slight curve, which allows fits well with both straight and curved case lugs. The usable length of the buckle end is 3 1/8" (79 mm), on the part of the strap with the holes, the first hole is at 2 " (51 mm) and the last hole is 3 5/8" (93 mm). 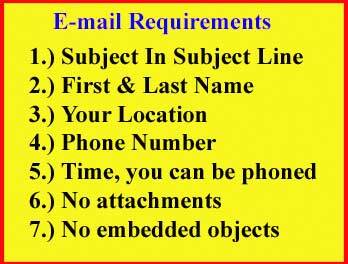 Usable minimum length is 5 1/8" (130 mm) and usable maximum length is 6 3/4" (172 mm). Placed end to end total length of strap measures 7 3/4 inches. To determine if this strap will fit your wrist, take the measurement of your watch case from the case lug, to case lug. The distance will vary from watch to watch, some adding 1 3/4" while others the distance maybe 2" or 1 1/4". The reinforced ends has slight curve, which allows fits well with both straight and curved case lugs. The usable length of the buckle end is 3 1/8" (79 mm), on the part of the strap with the holes, the first hole is at 2 " (51 mm) and the last hole is 3 5/8" (93 mm). Usable minimum length is 5 1/8" (130 mm) and usable maximum length is 6 3/4" (172 mm). Placed end to end total length of strap measures 7 3/4 inches. To determine if this strap will fit your wrist, take the measurement of your watch case from the case lug, to case lug. The distance will vary from watch to watch, some adding 1 3/4" while others the distance maybe 2" or 1 1/4". High Quality Brown 22 MM Alligator Grain Style Rubber Strap with White Stitching and Stainless Steel Buckle. 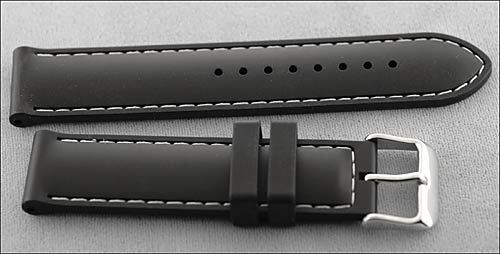 Strap is reportedly made from the same factory in Switzerland as many Omega rubber straps. 22 mm lug size by 20 mm buckle size. The reinforced ends has slight curve, which allows fits well with both straight and curved case lugs. The usable length of the buckle end is 3 1/8" (79 mm), on the part of the strap with the holes, the first hole is at 2 " (51 mm) and the last hole is 3 5/8" (93 mm). Usable minimum length is 5 1/8" (130 mm) and usable maximum length is 6 3/4" (172 mm). Placed end to end total length of strap measures 7 3/4 inches. To determine if this strap will fit your wrist, take the measurement of your watch case from the case lug, to case lug. The distance will vary from watch to watch, some adding 1 3/4" while others the distance maybe 2" or 1 1/4". Two tone silicone rubber sport strap with half bracelet link design. Buckle End measures 3 1/8 inches; Hole end measures 4 3/4 inches. End to first hole at 2 inch; end to last hole at 3 7/8 inch. Equipped with stainless steel buckle.